Baby praying mantis begins to eat immediately after emerging from eggs. 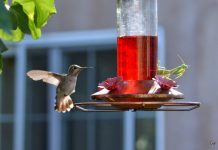 They will feed on tiny insects initially but as they grow older they must rely on more than one type of food. Baby praying mantis likely survives on small insects because these insects are abundant in summer. Perhaps that is why the eggs are hatched in warmer weather so young mantis could survive. 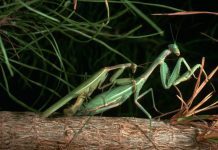 It’s time to discuss what do baby praying mantis eat in the wild. 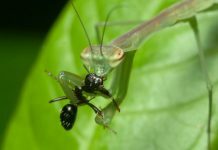 What Do Baby Praying Mantis Eat? Baby praying likely consume small insects much less aphids. Once they grow old, they will rely on larger prey such as beetles or even grasshoppers. 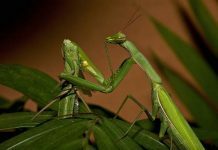 However, baby mantis do not need a lot to make up their appetite they may eat only once or twice a day. 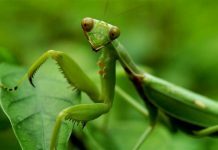 The diet of a grownup mantis includes tiny crickets, small bugs, gnats, fruit flies, and aphids. All these foods will probably be good once the mantis grows into adulthood. The best food to feed a baby mantis is a fly. The newborn mantis loves to consume flies.